"After a dominating season in Division 1 this year, we finally reached our goal of promotion to the SPL for the 2013 season! It’s been a great year and winning our league proves just that. Big ups to the EuroRefs, there is no doubt that the job they do gets too little credit. Also thanks to all players, vendors and organisers for making it happen. A special congratulation goes out to RMG Bratislava coming up from Div.2 with us last year and getting a 3rd overall with no reffing points. See you guys in the SPL next year! A special thanks to our owner Kerem Barkul for giving us the opportunity to play competitive paintball at the highest possible level! "ML Kings would like to thank MAXS, Draxxus, and MacDev for the brilliant support they provided us throughout the season. With their help and a lot of hard work we accomplished our goals for 2012. We look forward to seeing you in 2013 in the SPL!" "Team RMG Bratislava would like to thank the Millennium Series for a great 2012 season. This tournament means a lot to us, because it is an event where quality games, top condition fields, professional reffing and great competition meet together. Keep doing well Millennium! We also want to thank MAXS Family, MacDev, DXS Paintball, Sly Equipment and Paintball Action Park for their support which helped us to perform at top level. In the last years we have moved from 5men through Div2 and Div1 to SPL, achieving podiums at each level. SPL is a bigger fish to fry and that’s how we like it. It’s great to know that we will meet our friends from Izmir and ML Kings again, they did a great job this year and they deserved their 1st and 2nd place overall. Last but not least we would like to thank our fans, close friends and families for being there for us when we needed it. Well let’s have a great winter season, wish you all Merry Xmas and Happy New Year:) Hit like if you love paintball http://www.facebook.com/TeamRMG"
"We won our place in Division 1 last year and this year we earned our place in SPL….. it's amazing !!! Our efforts, training, patience, passion, but also fair play ended up really paying off. 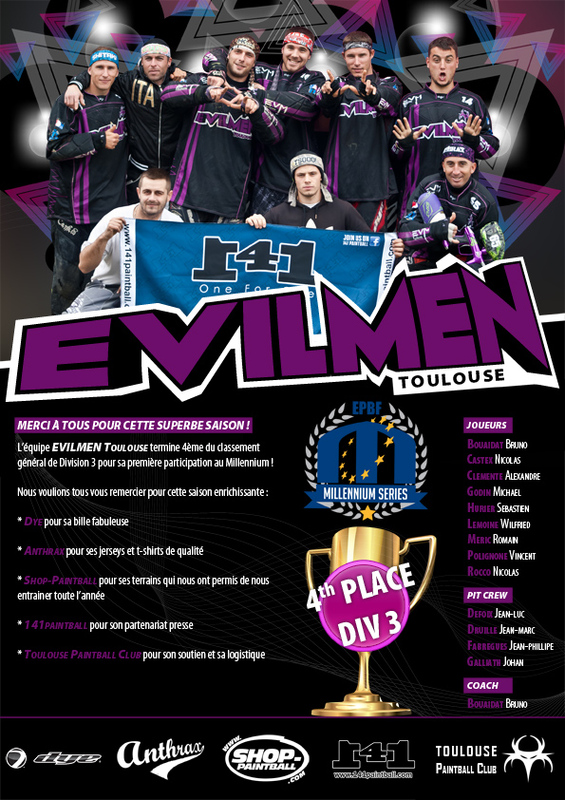 We would like to warmly thank the Millennium Series team for the perfect organisation of this event. We would also like to show a lot of affection for all of you who supported us this year. The players for the many constructive games we played together, the pits, the coaches and the trainers without whom all these contests could not happen and all our fans. To sum up, it was a real pleasure to participate in the Millennium Series events. A special thanks to G.I Sportz, Sport Attitude, Arc Evasion, the Illico Painto Association, the B&B hotels. Thank you all for making it possible ! Provided our resources allow us to keep going, we will proudly represent our region Burgundy, our town Dijon and why not you (!?) in Division SPL next year. Sponsors and partners, we are looking forward to hearing from you ;-)"
“High expectations. Others had them, we had them as well. We really wanted to win the Paris event and others expected us to do so or at least to end up on the podium again. But we all know it didn't happen: in fact, we didn't even make the podium. We missed it by ONE spot, we were THAT close. But hey, you win some, you lose some... What we didn't lose, was what mattered the most: that spot at the top of the overall ranking, making us Division 2 European Champions and promoted to Division 1! We had to fight for it the whole season long and experienced some real nail biting moments, but eventually all the hard work, the training, the sacrifices and the ongoing passion for the sport really paid off. Division 1 here we come! Of course we wouldn't have made it this far without a lot of love, help and support. We’d like to thank TAC-Paintball for helping us wherever and whenever they can, Bob Long for the G6R markers that shoot laser beams, Celtic Paintball for supplying us with the paint that gets you on the podium everytime, RAZA for the excellent jerseys, Ninja for the best air system there is and dssp8ntball.com for all the love and ongoing support. To all the fans and supporters we would like to say once again: thank you for all the support and help! Hope we count on all of you next season! We also would like to take this opportunity to congratulate Scorpions Milano and NPP Valenciennes with their 2nd and 3rd place in the overall ranking and promotion to Division 1! We are looking forward to stepping it up a notch in Division 1 next season and battling it out once again!" "It has been a great season for Scorpions Milano!! Finally our dreams came true!! It has been a very busy and difficult year for the team with a lot of training and hard work in order to achieve good results. Nothing would have been possible though without the help and support of Maxsimus Lundqvist, on and off the field!! He made the team train hard and helped us becoming great players!! This is why we want to thank him for everything!! We are also extremely happy the team has an on-going collaboration with Dye, which has chosen to represent us in Italy! And the best way to show them our gratitude was by winning the Italian Championship, the CPS event in Milan and last but not least the Millennium Event in Paris!! Also, from next year the Scorpions Milan will move up to the Division 1!!! We want to thank all our friends and supporters that followed us throughout the whole year and our 'big boss' that did not let us miss anything!! All this is making us feel like a professional team, so thank you all!! Also, a big thank you goes to the Dye Family for the great DM12 Guns, the Dye gear and the amazing Paintball Dye CG!! Thank you to our main sponsor Camo Sport S.R.L. for the support! Thank you to our friends and sponsor Globe Soldiers!! See you next Year in Division 1!!!" MAXS for equipment, MacDev for markers, Draxxus for the paintballs and Sebtek for its support. "London Tigers 3 want to thank Richmond Italia and Steve Rabakoff for all their hands on help during the finals and also GI Sportz and Manic Paintball for all their support and stunning paint. Plus all the players from the Tigers Family for their great effort in such trying conditions. Thanks to all the refs and all the teams we faced, see you next year!"